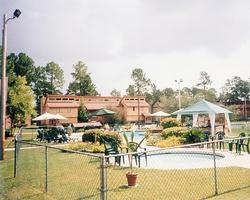 This resort is located in the city of Gautier where you will find many attractions and entertainment. The resort caters to its guests with beautifully designed and decorated units and amenities like an 18-hole gulf course, putt-putt course, an outdoor pool and jacuzzi. For more fun and activities you can head to the beach which is only 15 miles away and provides every kind of water sports imaginable. The cities of New Orleans and Mobile are not too far away and spending the day in either city will be well worth it. Your Carefree Journey Awaits!